Milford City Hall is located at 201 South Walnut Street, Milford, DE 19963; phone: 302-424-3712. Photo: Grier House, ca. 1890, 301 Lakeview Avenue, Milford, DE. Listed on the National Register of Historic Places in 1983. Photographed by User:Smallbones (own work), 2012, [cc-by-1.0 (creativecommons.org/publicdomain/zero/1.0/deed.en)], via Wikimedia Commons, accessed October, 2014. Milford, straddling the Mispillion River, lies partially in Kent County and partially in Sussex County. From its founding in 1787 to the present, the town served as a regional center for the surrounding agricultural countryside. 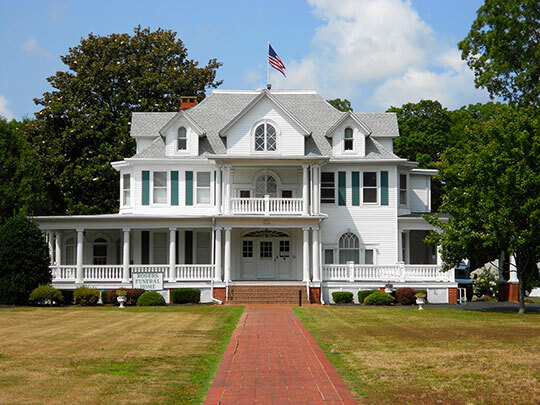 The region's growth and prosperity can be traced in the architectural and geographic development of Milford. The early history of Milford reflects the attempt by a small number of entrepreneurs and landholders to establish a center for commerce and industry. Milford is halfway between the state capital of Dover and the seaport town of Lewes. Both of these towns are considerably older and Dover is much larger. In addition, its location, at the head of navigation on the Mispillion River, placed it in an excellent position to develop as the main center for the area between Dover and Lewes. Other towns had been laid out and settled during the last thirty years of the eighteenth-century but none achieved the size and importance of Milford. Only Seaford, on the Nanticoke River, in the southwest corner of the state approaches the size of Milford. That town, like Dover and Lewes, is just over twenty miles from Milford. Milford started as a small riverside community organized by Reverend Sydenham Thorne and Joseph Oliver. In 1787, Thorne and Oliver agreed to develop their holdings and attract others to the area. Oliver sub-divided his farm into town lots and Thorne erected a mill and wharves. The town grew rapidly on the north bank of the Mispillion and soon spread north and east away from the mill. The mill was located at the foot of Mill Street at the river. The mill was followed by a number of the mills in the same area. These mills have been replaced by modern structures. By the mid-nineteenth century, north Milford was mostly developed and the town began to occupy the farmland on the south side of the Mispillion River. The shipyards had already been located on that side. Some workers' housing was also located there. South Milford did not extensively develop until after 1870. The historic maps that accompany the National Register nomination dated 1859. 1868, and 1885, illustrate how the town grew and changed greatly in the 26 years spanned by the maps. According to local histories, the first settlers to see the Milford area were a boatload of Swedes, Finns, and Livonians (a small country under the control of Sweden, now part of the U.S.S.R.), who landed a short distance north of the Mispillion River in 1630. They did not stay long but continued north to the New Castle area. Individual settlers followed. They stayed and established family plantations. Outside land development companies and speculators also helped develop the region by purchasing large tracts of land for eventual resale. The Barbadoes Company, organized by men from Barbadoes, and the Pennsylvania Land Company from Philadelphia, were the most active. The particular tract that Milford is located on was taken up in 1680 by Henry Bowman, with the condition that he build a sawmill on his land. The early name for the area, Saw Mill Range, derives from the presence of the sawmill. Bowman's land holdings, which totaled 2,000 acres, were slowly broken up over the next one hundred years as a result of debt and inheritance. Within the town's boundaries, three separate properties emerged by the third quarter of the eighteenth century. John Cullen had the farm at the northwest end, which includes the Parson Thorne Mansion. Levin Crapper had the farm that included South Milford and built the original block of Causey Mansion. In 1771, Joseph Oliver bought the major portion of the land on which North Milford sits. It is east of Cullen's Farm. Oliver was a merchant/farmer and was involved in shipping local farm products to market from wharves along the river. He also operated a small store. In the early 1770's, an Anglican clergyman named Sydenham Thorne arrived in town. He is described in local histories as a wealthy and educated man who married a local widow, became rector of Christ Church (K-1694.89), and took over the Cullen Farm in payment of a debt owed to him. Thorne is the one who can actually be credited with the idea for a town along the Mispillion River. In 1787, he proposed to Joseph Oliver that the Oliver Farm be divided into lots and that he, Reverend Thorne, build a mill dam across the river at the site of the town. Oliver agreed and had the land divided into lots. Thorne built the dam and at the same time built a sawmill and a gristmill along the riverbank. The town was laid out in a rectangular grid pattern on the north side of the river, and east of the Thorne mill site. It filled in quickly. According to a 1790 newspaper account, there were eighty buildings in the town. Until about 1820, the development of the town was almost wholly confined to the north side of the river. The numerous survivals in this area from the early settlement indicate that it was a prosperous community with substantial homes. As the town prospered it expanded east past North Walnut Street and north past N. W. Third Street. The development was mostly restricted to residential, commercial, and ecclesiastical structures, except for the mill complex near the west end of town on the Mispillion River and, later, phosphate manufacturing plants on the east side. Starting around 1820, the town expanded south across the Mispillion River along the south bank. Growth was occurring as a result of a burgeoning shipbuilding industry caused by increased agricultural activity and the production of surplus crops that could be sent to market. The surplus was moved on ships down the Mispillion River to the Delaware Bay and then to market. The local shipyards were engaged in building boats to carry the surplus to market. The town generated so much cargo, in fact, that an additional wharf was needed and sometime before 1859, H. B. Fiddeman and Daniel Currey built a canal at the east end of Front Street which gave the town the needed dock space. Building construction was almost wholly limited to shipbuilding-related activities with farms in close proximity to the new development. As prosperity continued in Milford, the original town spread over across the river and absorbed the farmland for house lots. Records do not indicate when the first shipbuilding took place in Milford, but some of the early builders were John C. Truitt, J. H. Deputy, Abbotts, Black and Company, Simpler and William F. Reville, Reville and Carlisle, and William G. Abbott. Their busiest period was from 1820 to about 1875. The yards produced many types of vessels useful to the local water trades and shipping industry. They ranged in size from 600 to 1,000 tons. As many as forty-five vessels would lay up in Milford during the winter months and almost this many could at other times be loading at the various wharves in town. Common cargoes included iron ore, black oak bark, quercitron, wheat, corn, rye, wood spokes, staves and cross ties. In 1840, twenty merchants did business in the town. Eight years later the town's first newspaper, the "Milford Beacon," was established by John Emerson. Emerson, though, soon moved to Wilmington and took his paper with him, but he was replaced by others. At one point, in 1875, four separate newspapers competed for readers in Milford. In 1856, a local newspaper, "The Gleamer," described the town, noting that the population was 2,000 people and that they, as well as the surrounding region, supported twenty-five stores, two hotels, and had twelve vessels regularly going between Milford and Philadelphia. The export trade from Milford totaled $351,000, while its imports totaled $235,000. The year 1859 was a watershed year for the town. In that year, the railroad was introduced to Milford. The Delaware Railroad line was completed through the state by 1859, with Harrington as its closest stop to Milford. In order to connect Milford to the main line, a local company was organized and named the "Junction and Breakwater." It reached Milford in 1859, and was extended to Lewes in 1868. The line was sponsored by the town merchants and a number of them were on the first board of directors. They included Governor Peter F. Causey, Truston P. McColley and his son Hiram, Henry B. Fiddeman, Daniel Curry and Curtis S. Watson. With the railroad, Milford was able to more vigorously compete in the markets as transportation was no longer wholly at the mercy of bad roads and unreliable weather conditions. The developing industries of the town could ship by rail and the population was more easily connected with the rest of the state. The industries on the eve of the Civil War were diverse and representative of the needs and the products of the Milford area. They included a husk factory, a woolen mill, a quercitron processing plant, foundries and machine shops, a pottery, fruit drying plants and canneries, and a phosphate factory. An atlas, published in 1859 of the town of Milford, shows the layout of the town. North Milford was heavily developed along N. W. Front Street and the blocks to N. W. Fourth Street to East Street are filled in. South Milford was less heavily developed, but the streets were laid out in their present location. A business directory on the map lists a number of political and religious figures, a newspaper editor, two attorneys, a druggist, a dentist, four doctors, eight merchants, a hotel, numerous mill complexes and specialized craftsmen, such as a jeweler, carriage builder, marble worker, two clothing stores, three shipbuilders, and an architect and a cabinetmaker. With the end of the Civil War in 1865, the town suffered an economic slump and many farmers left the area. However, by the mid-1870's, the town had recovered and new businesses were being started. The business section of S. Walnut Street was improved and the Windsor Hotel was built then. † Stephen G. Del Sordo, Historian, Delaware Bureau of Archaeology and Historic Preservation, Milford Multiple Resource Area, Kent and Sussex Counties, Delaware, nomination document, 1980/1982, National Park Service, National Register of Historic places, Washington, D.C.